Increasingly, businesses are aware of corporate social responsibility and have strategic plans in place to achieve diversity targets. But without experience hiring people with disability, they can find it difficult to hire the right people for their business. EPIC has almost 30 years’ experience working with employers and job seekers, and has helped businesses of all sizes secure great employees for their team. 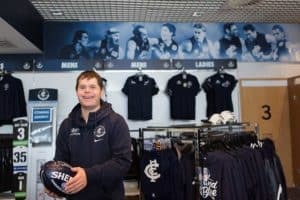 Dan has become a valued member of the team at Carlton Football Club. Our Corporate Account Managers work in partnership with major businesses across Australia to employ people with disability. We also work with major businesses to roll out diversity and inclusion training with an aim to build employer confidence in employing people with disability. Our relationships are based on trust, understanding and respect for businesses and their current employees. We work to understand your hiring practices, workplace culture and goals, before matching hard-working, enthusiastic and skilled job-seekers to suitable roles. We look forward to building mutually beneficial relationships, where our job seekers become long-term valued employees, and business’ workforces reflect the diversity of society.